Foothill Ranch, Calif. (February 4, 2018) – Round 5 of Monster Energy® AMA Supercross, an FIM World Championship kicked off Saturday afternoon at the Oakland Alameda County Coliseum in Oakland, California. Monster Energy Kawasaki riders Josh Grant and Eli Tomac qualified directly out of 450SX Heat Race 1 with Tomac finishing second and Grant fifth on a rutted and difficult course. As the gate dropped on the 450SX Main Event, Tomac and Grant circled the opening lap in seventh and eighth, respectively. While making moves towards the front, Tomac collided with another rider at the end of the third lap. Tomac remounted his KX™450F in 20th position and began his long climb back up to the front on the grueling, technical track. Grant held on to finish 10th place with Tomac close behind in 13th place. 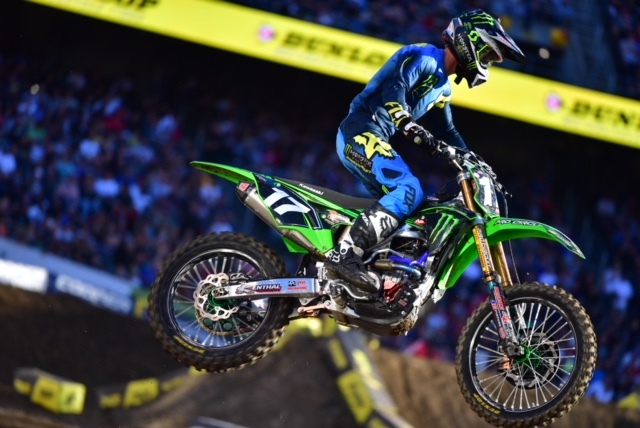 Monster Energy/Pro Circuit/Kawasaki riders, Joey Savatgy and Adam Cianciarulo began the evening on the right foot as Cianciarulo set the fastest time in qualifying and both riders qualified second out of their 250SX heat races. At the start of the 250SX Main Event, Savatgy was fourth, while Cianciarulo had another rider go down right in front of him, setting him back to 19th on the opening lap. Savatgy made the pass for third place on Lap 3 and immediately began pressuring the leaders. Savatgy was forced to play both offense and defense for 19 laps as he attempted to keep his KX™250F in a podium position. When the checkered flag flew, Savatgy crossed the line in second place, while Cianciarulo showcased an incredible come-from-behind performance to finish in seventh place. Savatgy has now moved up to second place in the 250SX Rider Point Standings and sits just three points out of the championship lead.